Well, this month is my first DT presence over at the Christmas at Sweet Stamping challenge blog. I’m thrilled to join this group of wonderfully talented crafters. Each month on the second Wednesday I’ll be bringing you a Christmas card to help me and you start to accumulate those Christmas cards so we don’t have a mad rush to make cards at the end of the year. For my card, I used a stamp set from Ellen Hutson called ‘Mondo Holly’ which I coloured with my Stampin Blends in Old Olive, Cherry Cobbler and Crumb Cake. I cut the panel apart for some interest and added some ramdom sequins. I then added the 2 pieces to a black card base and I was done! Please pop over to Christmas at Sweet Stamping to see all the lovely DT inspiration, I’m so happy to be part of this team and looking forward to having lots of Christmas cards and decorations made before we reach December. Today my card is a technique piece inspired by the challenges at CAS Stencil and AAA Cards #135. I’ve not tried ‘ghosting’ before, but after giving it a go for these challenges, I think I might be doing it a bit more often – saying that you do need to choose an appropriate stencil – I did dud out 3 times – LOL! Ghosting is where you colour a watercolour panel using water soluble crayons, inks or paints – I sponged Catherine Pooler ink in Flirty Fuchsia. I laid my Tim Holtz ‘Scribbles’ stencil over the coloured panel and rubbed over it with a baby wipe to remove the colour – leaving a ‘ghost’ of the stencil image! You need to be a bit patient here and wait for the piece to dry fully to see the results – but it’s worth it! So here are my elements for this card that follows the AAA Cards requirements: a sentiment, a stencil background, a die cut and a single matt panel and for the optional twist you could say this was for a fabulous friend! Isn’t it pretty? Thanks for looking and have a great day. This week’s challenge over at Watercooler Wednesday Challenge is a feminine anything goes challenge with Kath as our lovely hostess. For my card, I stamped my sentiment a few times and white heat embossed it. I love the ink smooshing technique so decided to do a bit over the sentiment to form my background panel. I used Tim Holtz Distress Ink in Twisted Citron, Broken China and Seedless Preserves. I then stamped my yoga girl in Momento black ink and coloured her with my Stampin Blends. I fussy cut her out and mounted her on top of the ink smooshed background. I then mounted the finished piece on black then white card stock and the card was done. Come join in the fun and make a feminine card. Check out the projects that the other artists at Watercooler Wednesday Challenges have created then take the challenge and link your creation to the challenge post. We’d love to have you join us. You have until Tuesday, 12th March at 10:00 Melbourne Time or Monday 11th March 5pm US Mountain Time to link up your project. I’m in desperate need of some birthday cards as we have a stack of birthdays coming up for Miss K and her school friends. As per usual, I went to my card challenge list for inspiration. This first card was inspired by The Card Concept, Just Add Ink and Just Us Girls. I loved the colour scheme in the Card Concept inspiration photo and the background panels in Just Add Ink, so when I stamped my card I focussed on yellows and green and then cut my panel up and separated them to mimic the grout and added the birthday sentiment in one of the gaps. I used a stamp set from Altenew called ‘Floral Art’ inked up in Catherine Pooler inks in Tiki Torch, Tiara, Limoncello and Melon Ice. Next is a card for one of Miss K’s friends who is turning 13 next week. I loved the sketch at Freshly Made Sketches and #simplestamping idea at the Paper Craft Crew Challenge. I used a stamp set from Altenew called “Halftone Circles’ inked up in Catherine Pooler inks in It’s a Girl and Be Mine for the cicles parts of the sketch and a sentiment from CAS-ual Fridays called ‘Bold Wishes’ for the square part of the sketch and then I die cut number balloons for the leaf part of the sketch. I added a bit of twine for the balloon string and mounted it all on a black card base. I think this is pretty simple and could be made by a beginner stamper. Lastly a card for Miss K who turns 12 later this month. I’m being guided by the Little Red Wagon, CAS(E) this Sketch and Seize the Birthday for her card. Miss K loves sloths (LRM challenge) so when I found a stamp set with sloths on it, I knew I had to make her birthday card with it (STB challenge). I stamped one of the sloths and coloured him in with my Stampin Blends. I created the sentiment on my computer. I die cut a frame from SU Mossy Meadow cardstock (CTS challenge). I hope she likes it. Thanks for looking and have a great day. Happy weekend everyone. Looks like here in Melbourne, we’re in for another scorcher so getting my crafting in before the day heats up. First up is a card for the Library Challenge. I was inspired by the cover layout and colour. I used Stampin Up products for my card. The stamp set is ‘So Hoppy Together’, I love these cheeky frogs and added some googly eyes for extra character. He’s coloured in with my Stampin Blends and popped up on some die cut circles and leaves from the ‘Botanical Blooms’ bundle. Next up is a card for the Snarky Stampers challenge which is all about D for diet! Now it was difficult to choose a card for this challenge as I was having so much fun playing with a new stamp set I got with a magazine called ‘New Year, New You’. In the end, I settled on the cake. I stamped, coloured and fussy cut the cake and strawberries and mounted them onto a card base where I’d ink smooshed some blue ink. Mounted them all on a bit of black and white striped cardstock and then a white card base. I think I’m feeling hungry now! Next is a card for 2 challenges – AAA Cards and Addicted to CAS. I water coloured the little pig from the ‘Birthday Farm Animals'” by Simon Says Stamp and added him to a card base with a stencil from MFT ‘Checkerboard’ that looked like a grid. I used some modelling paste with a little bit of Stampin Up ‘Soft Sky’ ink mixed into it for some colour. The sentiment is from Stampin Up ‘Itty Bitty Birthdays’. Lastly is a card for the CAS Colours & Sketches and Male Room challenges. 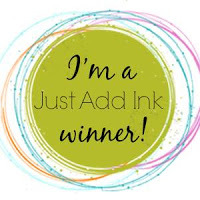 I love this sketch and thought it might go well with my Stampin Up ‘Geared Up Garage’ bundle. I kept it pretty simple with the gears die cut from silver cardstock and the sentiment heat embossed in silver on a black base and then mounted on white. Well, that’s it for today. I need to get ready for Miss K’s netball. Thanks for looking and have a great day.